Are you having a bad day today? Maybe you’ve been having a bad week? Or perhaps you’ve experienced a severely stressful incident at work that has you off your game. 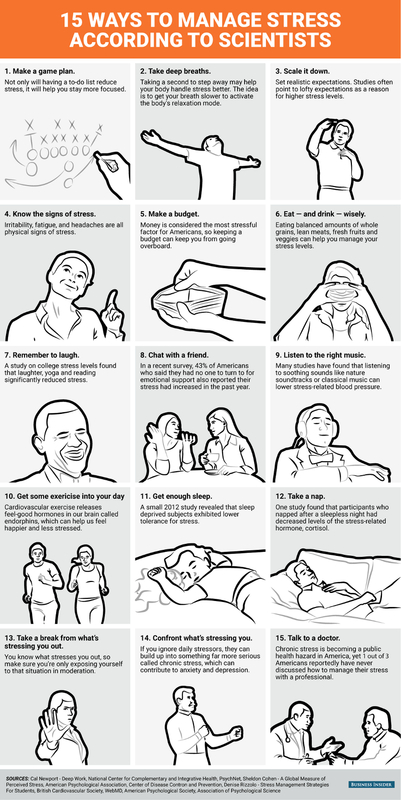 Here are some fast ways that you can manage even severe stress to help you take the next step forward. Know in advance what you’ll do if you encounter severe stress. If you have a to-do list of options or coping skills to implement, the stress you experience won’t feel so bad. 2) Take Several Deep Breaths. By taking deep breaths, you’ll had more oxygen to your blood. This will give you more energy while countering the dump of cortisol you’re experiencing. Work to get your breaths deeper and slower before returning to work. Eating a balanced breakfast sets the stage for stress resistance throughout the day. Eat a healthy lunch and bring healthy snacks with you to munch on. A few apple slices, some trail mix, or fresh veggies is a lot better than a bag of your favorite candy. Over 40% of people say that they feel better after a stressful incident if they can talk about it with someone. If you have a trusted co-worker around, see if you can chat for a couple of minutes. Otherwise, wait for a break and then call a loved one to talk. Having the right amount of sleep every day can increase the body’s resistance to stress as well. About 7 hours, going up to 9 hours for some, is necessary to receive this benefit. If you’re not able to get that much sleep, see if you can carve out some time for a nap. Stress continues to increase and fester the longer you permit it to exist. Confront the issues which create stress for you, no matter how hard it might be. You’ll feel better, even if the outcome doesn’t create a dream scenario for you. Laughing will reduce your stress levels. Even smiling can be enough to break the cycle of stress. It doesn’t even need to be a genuine laugh or smile to be disruptive to severe stress. If you manage your stressful situations wisely, then you can counter its negative effects to stay productive.